Blogger have developed and launched so many useful features on Blogger, such as Blogger template designer, email and mobile posting, mobile template, and many more. Blogger really know what user needs. 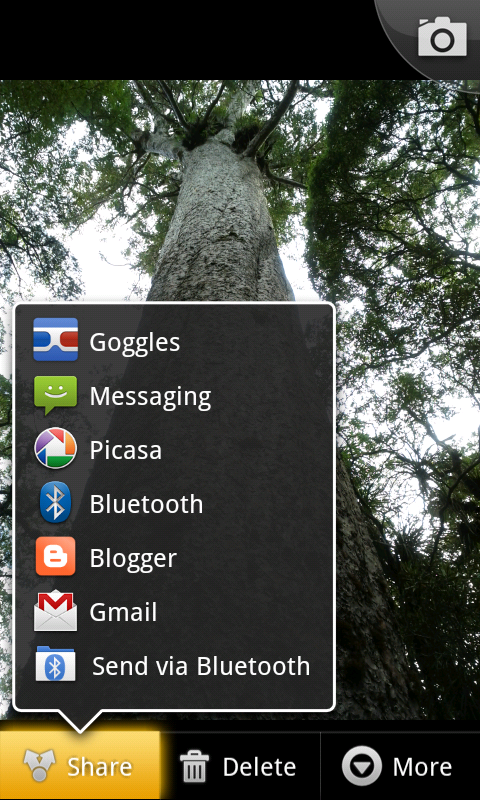 Yesterday Blogger have launched Blogger Android Application. 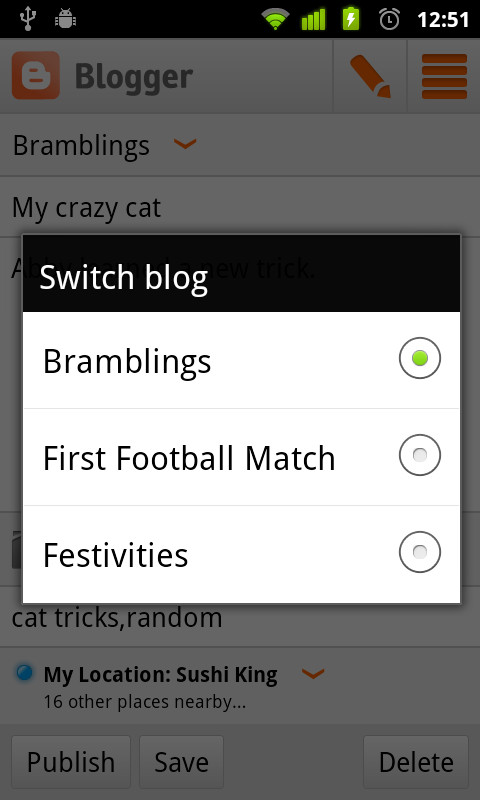 Yes, this is Blogger Application on Android mobile phone. 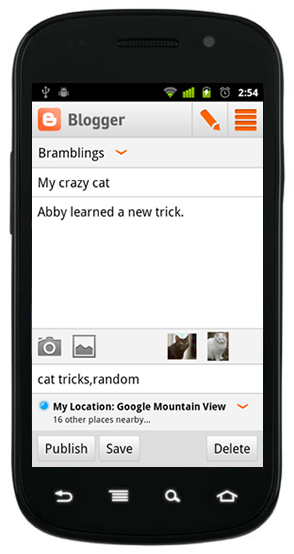 Have you ever wanted to write up a quick blog post from your phone easily and directly? Now there is an easy way to do this on your Android phone! Blogger have announced first version of the Blogger Android Application. Using this application you can easily compose a post, attach a photo that you just took with your phone, and either save it as a local draft for later or immediately publish it to your blog. If you are an Android user, you can start using the Blogger app today by downloading it for free from the Android Market. Blogger Android Application embedded with useful features as on Blogger on desktop version. Multiple accounts and blogs: Similar to Blogger on web feature, Blogger Android app also have multiple account access. You can easily switch between different accounts and blogs that you have author rights to. Simply choose your account and blog. Write and save/publish: What you can do on Blogger web, you can do it on this application, such as write a post, assign labels, and then either save it as a draft or immediately publish it. Saving as draft is handy if you need to wait until you have Internet connectivity. So you won't lose your post. Photos from camera and gallery: Maybe this is most favorite feature especially for photoblog owner. If you see something interesting, you can take a picture directly from the app and include it in the blog post. You can also browse your gallery to include the ones you like. Simply, take and publish. Sharing to Blogger from gallery or browser: Blogger is one of the available sharing options. Find an interesting picture while browsing and want to share it, you can share the content to the Blogger app directly from the sharing menu. You also can share from your own gallery. Share location: You can share your location by activating the location bar and selecting the correct location. This information will be included in your post. I think this Blogger android app really useful and helpful especially for mobile person. You can post wherever and whenever you want, simply from mobile phone. For this time, this app is available only on Android devices but we hope it will support other smartphone platforms to allow more of Blogger users to easily post to Blogger on the go. according to latest independent survey 54% American love to switch on Apple iPhone whether they are using android phone or WP7 phone . But i guess android will capture the market soon. Excellent post and i have book marked this. Great post. May i copy n translate it to my blog? This post was very helpful. I have been using the android applications from almost an year now and I must say that android application developers have actually made android a very flexible OS. I like it bcz i was seeking for such type of info. Thats a great news, Thanks for sharing. We at Openxcell develops as well as customize various mobile application as per clients need, you can have a look at out portfolio's at our site. Mobile application is on boom and now days people are crazy in using mobile application on their touch. Blogger is the best way to share knowledge. I am using this on my Samsung Galaxy Tab, and its working good. Anyone can try this application on their android phone. Is it possible to use this blog and post it on my blogs? If possible I want to publish it on my blogs. Thanks. You can easily publish posts with pictures, labels and location information. It as a local draft for later or immediately publish it to your blog. If you are an Android user, you can start using the Blogger app today by downloading it for free from the Android Market. Such as write a post, assign labels, and then either save it as a draft or immediately publish it. Saving as draft is handy if you need to wait until you have Internet connectivity. So you won't lose your post. Blogger Android app also have multiple account access. You can easily switch between different accounts and blogs that you have author rights to. Simply choose your account and blog. such as write a post, assign labels, and then either save it as a draft or immediately publish it. Saving as draft is handy if you need to wait until you have Internet connectivity.